William Stephens began his career as a railroad laborer and grocery clerk. He eventually served as U.S. Congressman and Lt. 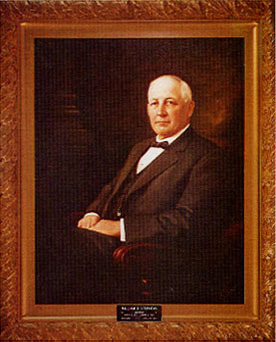 Governor prior to succeeding Hiram Johnson as Governor. It was a time of great upheaval in California—Stephens was supporting prohibition and women were fighting for the right to vote (which passed in California in 1911). Additionally, World War I began. Stephens' administration suffered threats and bombings. The Governor's Mansion was bombed in 1917 by labor radicals. In an unrelated incident, $50,000 was demanded or both the capitol and the mansion would be blown up. Perhaps as a way to build morale, Stephens frequently backed special days such as "Ripe Olive Day," "Gauze Mask Day" and "Go to Sunday School Sunday." The ever bow-tied Stephens was admitted to the bar while Governor, and entered the practice of law after leaving office. Use the California State Library’s interactive tool to view Executive Orders and Proclamations signed by Governor Stephens.